Wanting to decorate your home for the holidays but the budget is small? All of these ideas are inexpensive and add a festive touch to my holiday decorations. I wanted to make sure that I had some new items this year, so I created some christmas decorations on a budget! 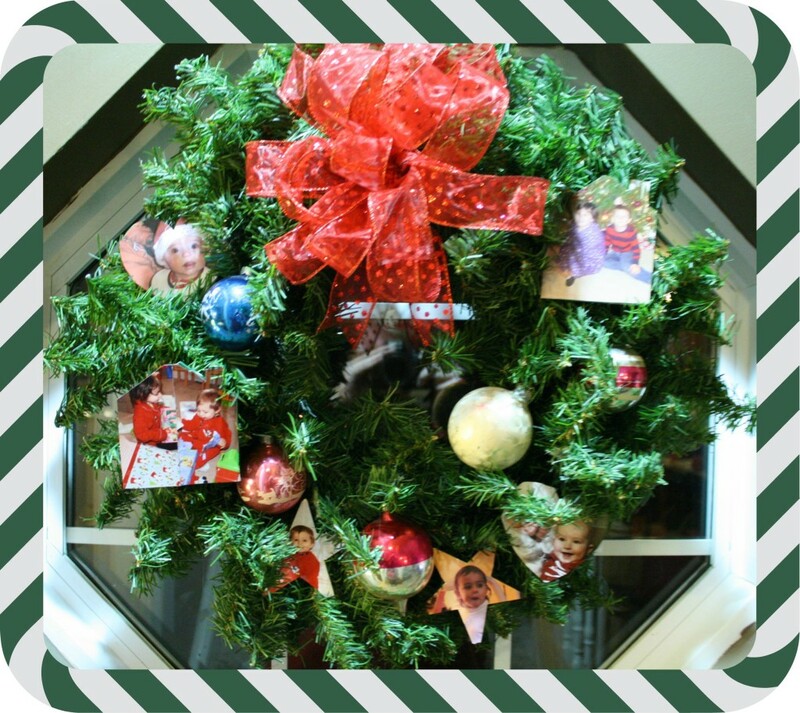 This Christmas Memory wreath cost less than $10 to make. It was super easy and makes a nice personalized addition to our decorations. I took an older wreath that I had and removed all of the old decorations. I then purchased some small wooden shapes from Hobby Lobby. These included 2 stars, 2 hearts, and 2 houses. I found pictures of the kids from past Christmas, especially when they were little, and cut them out to fit the particular shape. Then I glued them on and let them dry. I decided where I wanted my pictures, using my hot glue gun, I attached them. I added some vintage Christmas ornament balls that we had on hand to the wreath to give it a little more decoration. Finally, I made a new bow with some pretty ribbon that I found at Hobby Lobby. Bring some JOY to your decorations with this easy craft project that also cost less than $10. I purchased paper mache letters from Hobby Lobby that spelled out the word that I wanted. You could do Joy, Noel, Merry, anything really. I picked out some Christmas scrapbook paper and attached it to the letters. Finished it off by using modge podge over the letters. You could also add additional decorations to the letters to make them even more festive, I liked leaving these plain though. I have detailed instructions on how to make letters like these from my Halloween Boo sign that I created a few months ago. 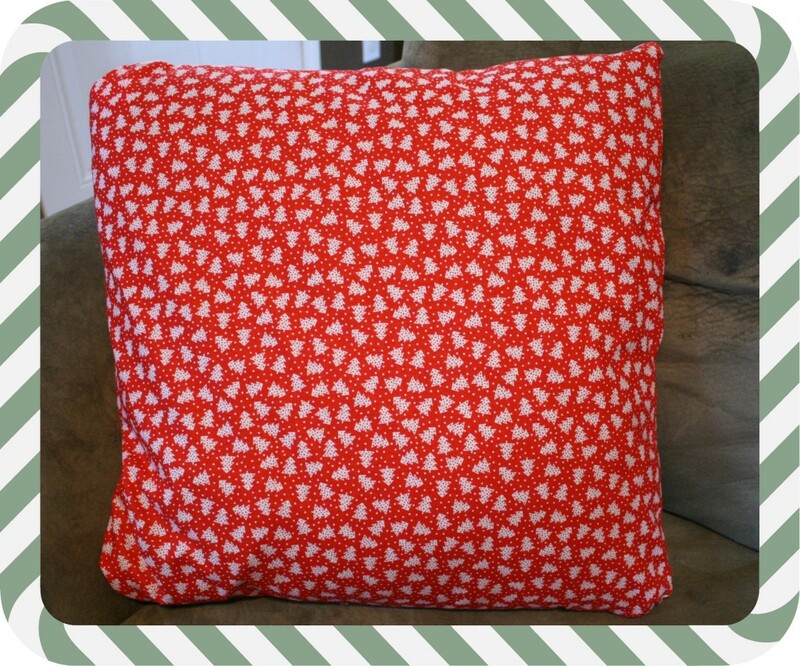 These holiday pillow covers were very easy to make. I was able to get the fabric with a 40% discount at Hobby Lobby and the cost was less than $20 for this project. One trick I have learned with purchasing fabric at Hobby Lobby: if they have the fabric marked down by 30%, you will do better to get it at full price and use the 40% off coupon that Hobby Lobby normally has on their website. When you are having the fabric cut, just have them write it up at full price. I measured the three pillows that I have in the living room to get the dimensions. 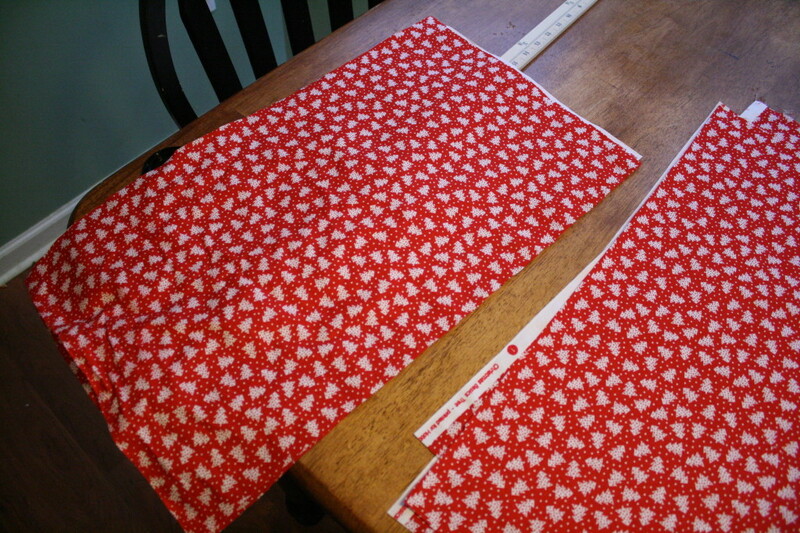 I then added an inch to each dimension to figure out how much fabric I would need for all three. This also helped me to know how to cut my fabric. I laid out my fabric and cut three pieces for each pillow: the large front piece which was cut to the size of the pillow plus 1 inch, and two smaller pieces for the back that will overlap. I had mine overlap by an inch and a half. 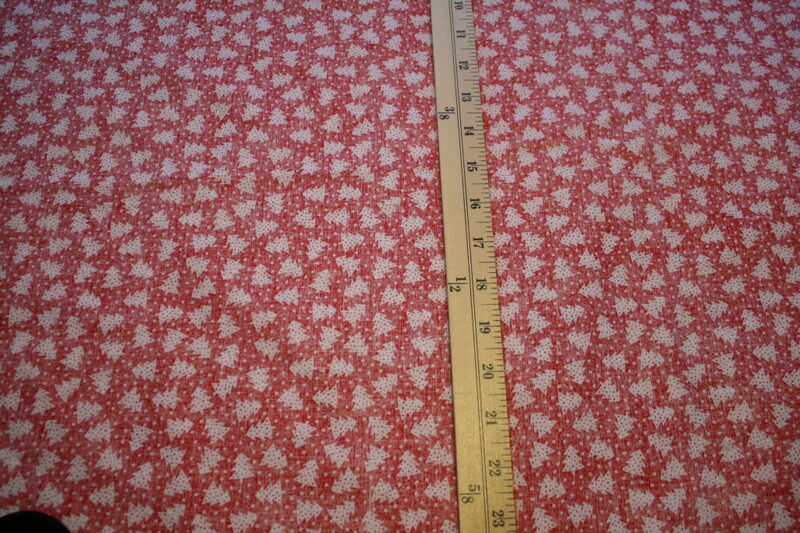 I then laid the fabric with the finished sides facing each other. I began sewing the pieces together, with the short one attaching first and the longer back piece attaching second. 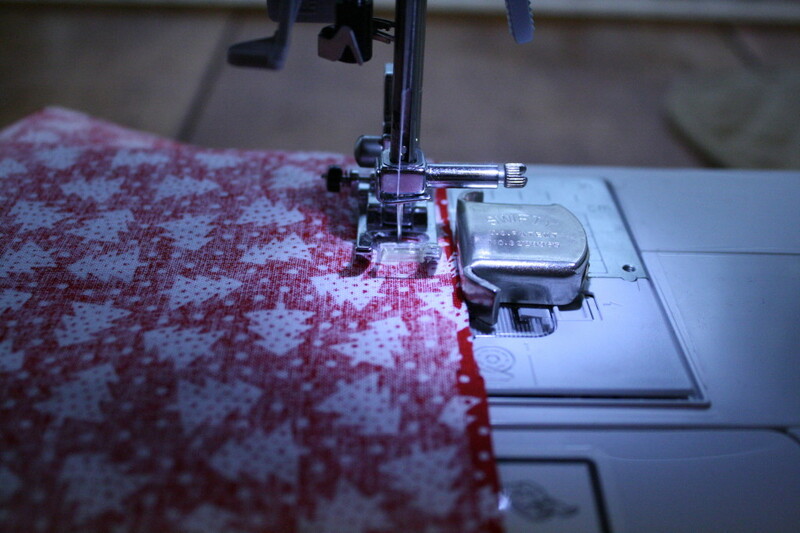 If you do not have the ability to sew, you can use a product like Stitch Witchery and iron the pieces together. When I was finished sewing, I had a pillow cover that was inside out. I turned it so that it was right side out and fit my pillow inside. It was simple! After the holidays, I will just slip them off, wash, and store for next year! Love these ideas. 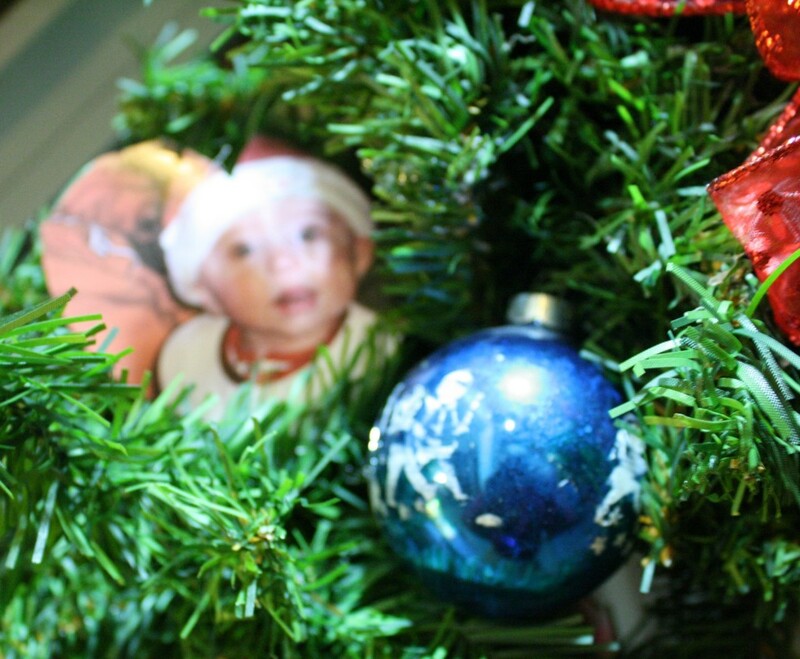 I love making our ornaments too and our tree is filled with handmade ones. I love the ones my son has done throughout the years. Thank you for stopping by Regina! Yes, I love having all these handmade items around. I love the ornaments my kids have made through out the years and even have ones I made as a kid. Love this idea. My mom made sand dollars one Christmas and I enjoyed helping her do them. I bought most of my things from the dollar stores but making them with kids are even better. Stopping over from SITS. Thanks for stopping by Kita! I really do love making things that bring back memories and I can use year after year. When they are affordable – even better! I really like your Joy letters! 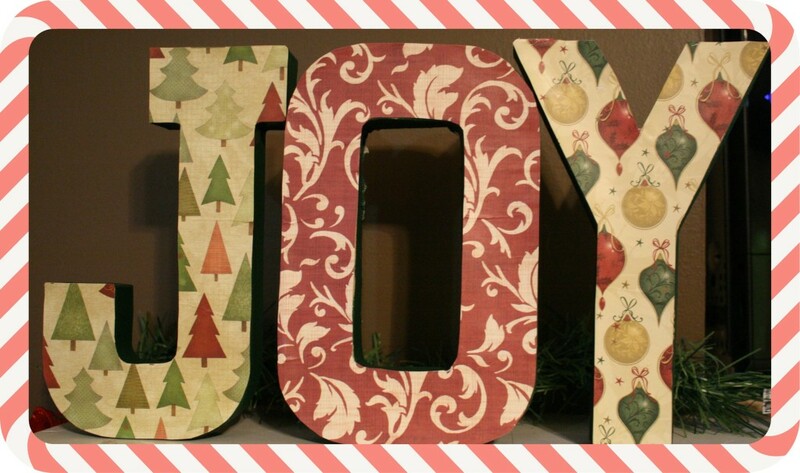 I have a “JOY” sign in my house too! I love all of these ideas! The letters are adorable and I love Mod Podge. I’m a horrible seamstress but I might try making some pillow covers since it looks simple enough.